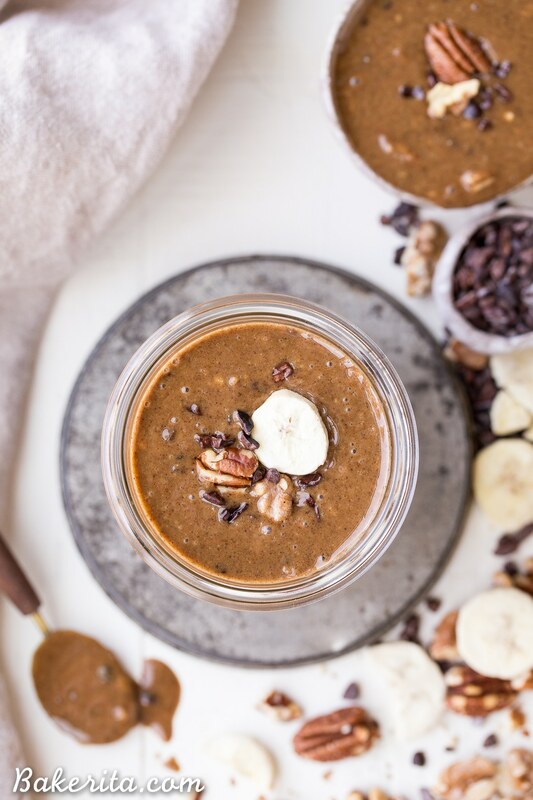 This Banana Nut Butter with Cacao Nibs is a sweet spreadable treat made with pecans and walnuts, and crunchy cacao nibs in every bite! 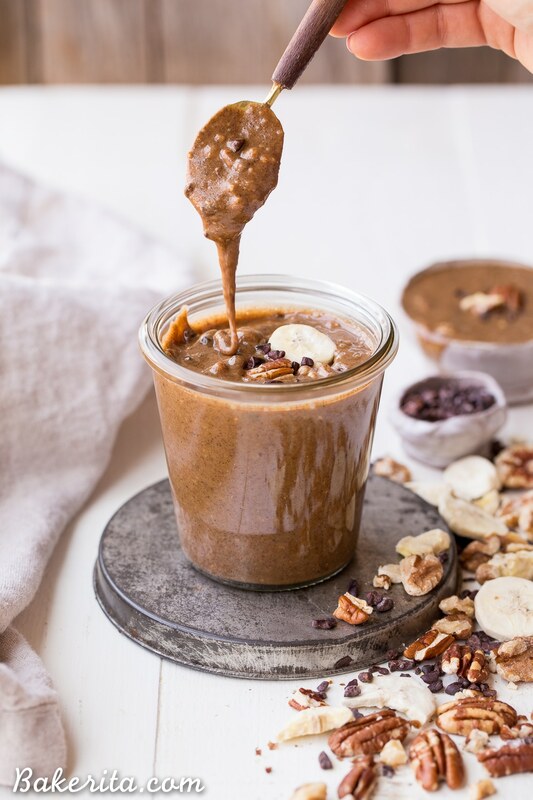 This sugar-free nut butter is paleo, vegan, and Whole30-friendly – you’ll want to spread it on everything. I’m baaaack with more nut butter! 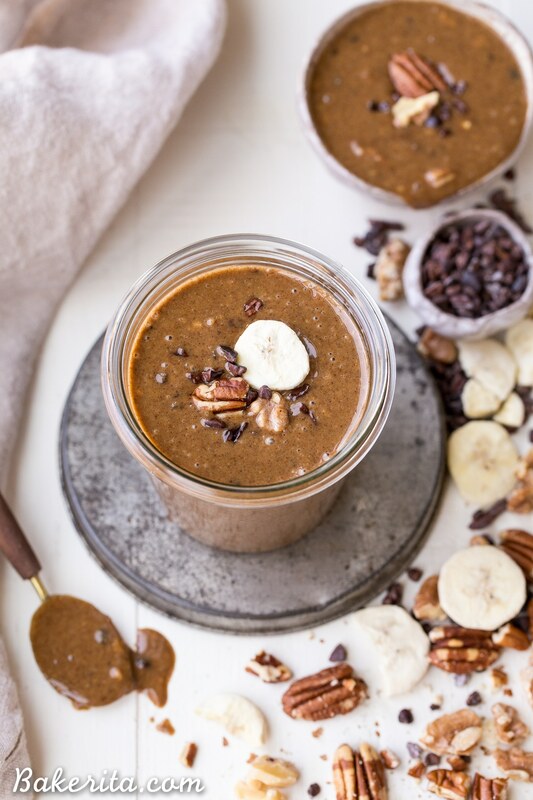 Sometimes I think I should just start my own nut butter company because I like making them so much… but if I did that, then I wouldn’t be able to share the recipes for all this goodness with you all! And that would be a tragedy, so here we are, with more nut butter recipes for YOU. If you’re already making your own nut butter at home, you’re fully aware of how delicious, satisfying, and EASY it is to make your own nut butters. But if you still haven’t hopped on the nut butter making train, I’m hoping one of my many nut butter recipes will convince you to go for it…how about my Strawberry Cashew Butter? 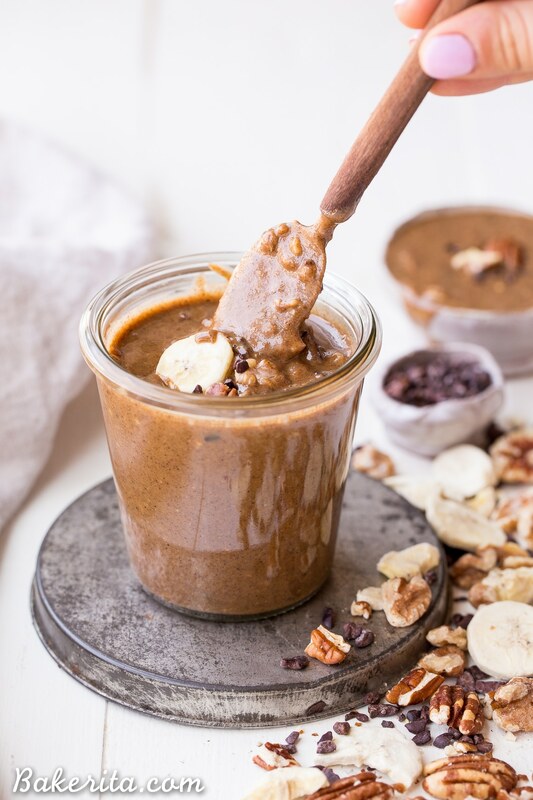 Or keep it classic with this Super Seed Nut Butter, or just make my newest…this irresistible Banana Nut Butter with Cacao Nibs! I’m a huge fan of putting freeze dried fruits in my nut butters to give them a burst of fruity, tangy flavor. It elevates the nut butters in the most delicious way, and they’re super easy to incorporate. By adding freeze dried bananas to this walnut + pecan butter, we get a flavor reminiscent of my Banana Nut Muffins, which is exactly what I was going for. And this banana nut butter spread on top of those muffins? Well that’s just utter banana perfection. The walnuts and pecans blend into the most drippy, creamy nut butter ever…maybe one of the drippiest combos I’ve tried! Since they’re both fatty, oily nuts, they blend up very quickly and easily. Once they’re blended into smooth, nutty oblivion, the flavor is amped up with the freeze dried bananas, cinnamon, vanilla bean powder, and salt. I give my recommended amounts, but you can always adjust to suit your tastes. I love enjoying this banana nut butter spread on apples, with bananas (for an extra banana-y treat! ), on toast, or drizzled over oatmeal, hot cereal, nice cream, and smoothie bowls. Once you give it a taste, I’m sure you won’t be hard-pressed to find ways to use it up. Get to nut butter making, and enjoy! Preheat the oven to 350°F. Spread the walnuts and pecans on a lined baking sheet and bake in the heated for about 8-10 minutes, or until fragrant and lightly toasted. Let cool for a few minutes on the counter top. You can also leave the nuts raw, if you prefer. When the nuts are cool, set aside 1/4 cup toasted walnuts to pulse in at the end. Add the rest of the nuts to your food processor or high-powered blender (I used my Vitamix). Process for about 3-6 minutes, scraping down as necessary. Your time might be shorter if you’re using a high-powered blender - it will take a little bit longer in the food processor and require more scraping down. When the walnuts and pecans have broken down into a smooth, creamy butter, add the freeze-dried bananas, cinnamon, vanilla bean powder, and salt. Process to incorporate, and taste. Adjust add-ins as desired. Finally, add the cacao nibs and toasted walnuts and pulse a few times to incorporate and break up the walnuts a bit. Transfer to a glass jar or two (like a mason or Weck jar) and store in the refrigerator for 2-3 months. This post contains affiliate links – thank you for supporting Bakerita! Love these recipes, as always!!! <3 What do you spread nut butter on while you're on a Whole30?? Thanks so much Amber. I usually eat it with bananas or apples! The cinnamon and vanilla bean powder… I’m SO in Rachel! Spread, slather, smear it on everything! I could totally see you making this stuff and selling it at! FTW! GOOD LUCK aid it lasts that long. We ate ours in less than a week! So so amazing! So glad you loved it Cheryl! It never lasts long in my house either :) thanks for your feedback! This is awesome, I cannot wait to make it. Can I use fresh bananas in case? I cannot seem to find freeze dried bananas in my area. Any suggestion? Hi Mitch – unfortunately, you definitely can’t. 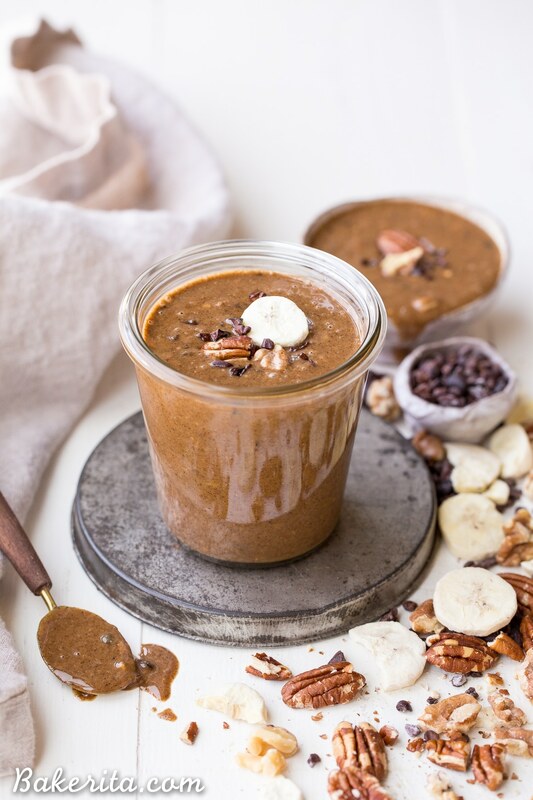 It’s a totally different texture of fruit, since the freeze dried bananas have had ALL the moisture removed – fresh bananas would make the nut butter go bad super quickly and the texture and flavor would both be off. I’d recommend ordering online if you can’t find freeze-dried bananas near you!